Qvevri – a large clay vessel of distinctive shape, used for winemaking. The Georgian word ქვევრი apparently means that which is buried, and gets transliterated into the Latin alphabet as qvevri or kvevri. Those two spellings exist because, while the official transliteration of the first letter is k, many Georgians use q because it has the correct sound and takes the same position in their keyboard as ქ. Most winemakers have now agreed to adopt the spelling qvevri, and it was also used by UNESCO when they gave it Intangible Cultural Heritage of Humanity status. Intangible? I don’t think you would agree if one dropped on your foot. No, actually it is the method of winemaking that was recognised by UNESCO, not the vessel itself. They also have other names in different parts of Georgia, but from here on I shall simply call them qvevri, and drop the italics. The size of qvevri can vary widely, from a few litres to the largest in current use, which is seven or eight thousand litres, but for winemaking a typical range seems to be several hundred to around three thousand. As 1,000 litres of water weighs a metric tonne, people also talk about qvevri capacity in terms of tons, which has nothing to do with the weight of the qvevri itself. 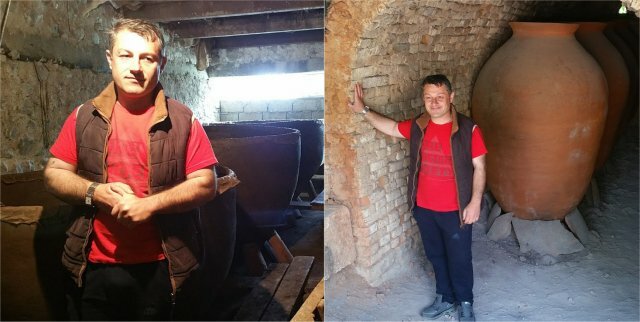 We asked a qvevri maker, Zaza Kbilashvili in the Kakheti village of Vardisubani, how much an empty one weighed. He didn’t know, but it took 8 men to move one of his larger qvevri, and that was the important measure as far as he was concerned. The pointed qvevri base is thrown on a potter’s wheel, but the rest is made as a coil pot, built up with sausages of clay. No tools or measuring instruments are used, everything being done by hand and eye, with the necessary skills being passed down from father to son. Zaza builds his qvevri in the basement of his house, which would hold around a dozen large ones, and I think he said the maximum size he could make was 2 tons. It takes him around three months to build up a batch of large qvevri, the progress each day depending on the weather – progress being faster on hot dry days, when the clay dries quicker to give a firm base for the next layer. The qvevri are then allowed to dry completely before they are lugged out to the arch-shaped brick kiln in the garden. Here wood is stacked around the qvevri to give correctly distributed heating for the firing, which takes seven days and has to be monitored continually. The final step is to give the insides of the qvevri a treatment of beeswax while they are still warm. This is to make the clay walls less porous to liquids while still allowing air to pass. The wax should soak into the larger pores, and not form a coating that prevents the wine from making contact with the clay. After manufacture, the qvevri are shipped to the winemaker, who traditionally would be in the same region of Georgia, but now could be anywhere in the world. They are buried alongside each other, with only their openings exposed, to create a marani, or wine cellar. The image shows the small marani in the Pheasant’s Tears restaurant building, which contains just a few qvevri of different sizes. These are used by the restaurant staff, but do not form part of Pheasants Tears’ main production. In terms of the number of steps involved, natural qvevri winemaking is very simple: at its most basic, you crush the grapes, put them in the qvevri, wait, and take the wine out. However it is also vital to make sure all the leftover gunk is properly removed afterwards, and that the qvevri are scrupulously cleaned. There are traditional tools for this purpose, but these days cleaning with a high-pressure water jet is a common. With larger qvevri, someone climbs down into the vessel to perform the cleaning operations, very large qvevri needing a small ladder for this purpose. The final step in the life cycle of the qvevri is usually not destruction. In Georgia, the tradition is to respect old qvevri that have been disinterred by leaving them out on display. The ones shown here are at Alaverdi monastery. The history of winemaking and the qvevri goes back in Georgia to at least the 6th millennium BC, as from that time qvevri fragments have been found with traces of wine tartrates and surrounded by grape pips. Since then, Georgia has seen 8,000 years of continuous winemaking in qvevri. The so-called European style of winemaking, using barrels, was introduced into Georgia in the 19th century. For a period European and qvevri methods were both used in Georgia, but I have not seen any analysis of how wine production was structured in terms of method and producer size. However, the Soviet period from 1921 is still within living memory and much more widely discussed. Production was centralised in large state-run wineries, and vineyards were taken into collective ownership. The large wineries, or wine factories as Georgians called them, worked with a very limited number of grape varieties, principally Rkatsiteli and Saperavi, and were geared up to maximise volume at the expense of quality, most of this volume being targeted at the Russian market. 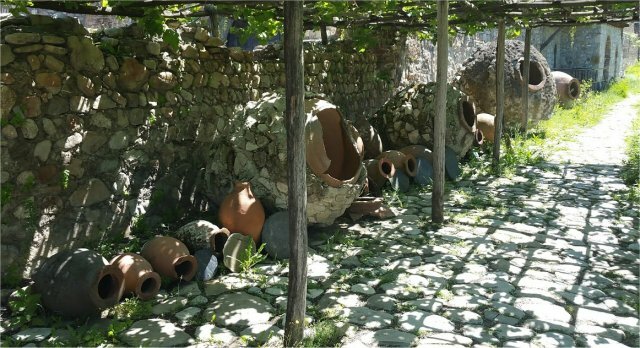 Meanwhile, very small-scale qvevri winemaking quietly continued in people’s homes, using grapes taken from their gardens. In post-independence Georgia, the large state-owned companies were privatised, other wine-producing companies emerged, and quality improved with an eye on new export markets. Some of these companies even adopted qvevri production for their higher-end wines. But there is another post-Soviet winemaking story to tell – a lot less important in sheer economic terms, but big in terms of prestige and future potential. Georgian individuals were each given a small plot of ex-collective vineyard, providing small-scale qvevri winemaking with a better supply of grapes, and forming the basis for the vibrant, though still small in percentage terms, natural qvevri wine movement of the 21st century. For some, winemaking ceased to be merely an activity that kept family and friends supplied, and more viable small businesses were created. Even then it seems it was usually necessary to have another source of income, perhaps by working as a professional in Tbilisi, or by running a restaurant or guesthouse alongside the winery. Larger vineyard areas were created by combining the allocations given to family and friends, or perhaps by renting neighbouring plots. And derelict cellars were restored, and new ones built. However, perhaps the key difference between this new breed of small winemaker and their predecessors is not so much production volume; it is that the wines were being bottled. 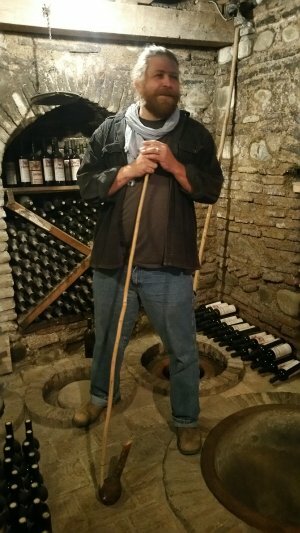 Thus, rather than being restricted to the limited market of their own village, they could be sold for more money in the shops and wine bars of Tbilisi – notably ღvino Underground – and get international exposure. When you are producing a few thousand bottles per annum, you neither want nor get the attention of supermarket buyers. But with the current cult interest in natural qvevri wines, to catch the eye of a sommelier from a restaurant of international renown is a distinct possibility. This entry was posted in General and tagged georgia, qvevri. Bookmark the permalink. After all the damage the Soviet Union did to wine production in so many Bloc countries, it’s an interesting point that it may have had some positive effect in Georgia. But then Georgia was always one of the main suppliers of wine in the firmer USSR. I really enjoyed this informative piece, Steve. Thanks David, and nice to hear from you again. It’s been a while, also on the UK Wine Forum. Hope you have been well. But what positive effect? I think the positive things only happened when the Soviet Union broke up. If you mean the continued use of qvevri during the Soviet period, that was despite the Soviet Union rather than because of it. Maybe I should have said “secretly” rather than “quietly” but I am not 100% sure it was actually illegal.